Without clear purpose, process and accountability a team will flounder and fail. The value of teamwork cannot be overemphasized. All organizations need people willing to share their ideas, listen to others and be involved in the problem solving process. These people provide the operational intelligence to solve problems and shape decisions that improve performance and customer satisfaction. To help you lead your team across the chasm from floundering to high performance, we explain creating accountability in this article. Performance accountability is the conventional kind. It refers to the tangible outcomes desired from the team and spelled out in the Charter (See Part One of this set of articles.). Developments of a new product, a new or revised safety procedure, a schedule for overtime allocation or reduced cycle time, are all examples of team outcomes. Conventional accountability is what the team is to accomplish and deliver to the organization. Process accountability requires careful definition of key team processes and their measures by the members themselves. 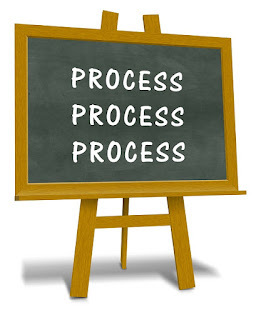 At the end og this article is a Process Measurement Worksheet example. In a successful team, members rely on each other to do their part and not let each other down. This is peer accountability when members support each other in getting the work of the team done. When team members discuss their expectations of each other, and accept them as "stakes in the ground" among each other then peer accountability is put into place. Peer accountability and its derivative, peer pressure, are far more effective then orders from the boss. Individual accountability exists when an individual member sets a standard for himself regarding taking initiative to help the team succeed. Team members, seeing what is needed accept a share of the responsibility for results and set the expectation of themselves to act beyond their usual role or the normal call of duty. For example a mechanical engineer was assigned to a team to redesign an overhead material handling system operating between machining stations. When the team generated the new design, he realized that the substitution of lighter weight plastics for metal could result in a lighter weight and safer system. However, there was little knowledge of plastics in the organization so he took it upon himself to learn more about the application of plastics and did technical cost analyses of substituting plastic for metal. Then he presented his work to the team which incorporated it willingly into their redesign. The individual initiative was fostered by the desire to support the team in achieving its goals. Individual initiative may and does occur in the hierarchical organization. But the combination of a performance challenge and peer relations and support in a team can generate enhanced personal motivation and initiative. In sum, successful teams discuss and agree to measures and checkpoints to monitor task, process and peer support performance. They work because they provide a common focus and language, define and reinforce the team process as well as performance. Without them a team is aimless and will flounder and fail. To answer check the appropriate point on the scale. 1. I feel about the work of our team. 2. How clear were the goals in this session? 3. I am ________________________to the decisions we made. 4. How much influence did you feel you had on the decision making? 5. How often did you feel other members really listened to you? 6. How often did you feel people understood what you said? 7. How much cooperation and collaboration did you feel took place? 8. To what extent were members open and leveling with each other about their thoughts and feelings,? 9. To what extent did you trust the people in your team? Dr. Mark Frohman, president of Frohman Consulting Corp., is a recognized expert in developing high performing leaders, teams and organizations. He has been engaged as a consultant, coach and facilitator by more than 500 clients. Dr. Frohman works with nonprofit and for-profit organizations ranging from start-ups, small and many family-run businesses to international companies and members of the Fortune 500 in executive coaching and training, strategy setting, team building, customer and employee relations, among others.